This style, in general, replicates what was typically the parents’ experience in their brick and mortar schools – with schedules, workbooks, textbooks, tests, grades, desks (or the kitchen table), and copious record keeping. There are now countless companies out there that will sell you a “school in a box” curriculum, both religious and secular, book based or video/online based: Seton Home Study, Calvert, Abeka Academy, etc. Another more intense option is cyberschooling through your state’s board of education or similar such as Florida Virtual School or K-12. Parents can also create their own curriculum, picking and choosing from various providers and creating their own schedule and tests. 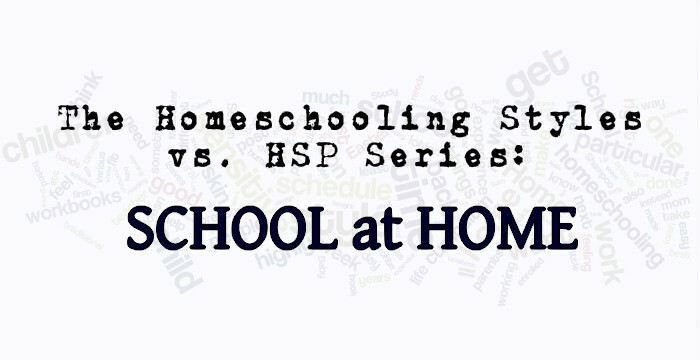 I’m not going to get into the nitty-gritty of how to do the “school at home” approach because I think 99% of my readers were not homeschooled and can imagine what bringing their elementary school experience into their home would be like. Let’s get right into the pros and cons, as I see them, of this form of homeschooling for highly sensitive parents and children. “School at Home” programs are usually highly organized, and they are organized *for* you – you don’t have to waste physical and emotional energy you may not have, to set up the program. With a “School at Home” style, it is usually easy to “do the next thing” when life gets chaotic or you are overwhelmed. The schedule is set up for you, or you can simply do the next page in the workbook or chapter of the textbook. It is what you as teacher are (typically) used to in your own schooling. It can make sense to you in a way a different style might not. This is also true of children who have been to school outside the home. If you have chosen a curriculum that is a good fit for your family, it can make it easier to just “get it done” so you have time to enjoy your own pursuits (both parents and children). This style can take some of the responsibility off you, if not in reality, then at least mentally. A “professional” designed the curriculum, made the schedule for you, and all you have to do is follow it. It can be easier to think that if it doesn’t work out for a particular child, if the child is struggling, it’s “not your fault.” Not that it ever WAS your fault, but having a professionally made curriculum to blame can make it emotionally easier to handle for some parents. Programs that take enrollment, such as Calvert or Seton Home Study, may provide on-call teachers to answer questions you may have. It can be stressful for sensitive people, when “life” gets in the way and you get off schedule, not to feel like you are hopelessly behind. With several children it can be stressful to maintain all the different textbooks, workbooks, and schedules involved, particularly when you are beholden to an outside source for due dates, grading, etc. It is easy for sensitive people to become a “slave to the schedule” because it seems like “law” and “the right thing to do” – trying to fit the child to the schedule instead of the schedule to the child. If you are using the “school at home” style in part *because* it is scheduled, it can be mentally/emotionally difficult to cross off entire chapters your child already knows, or add in extra work or a whole different book for the struggling student. Children are often more gifted in one area than another and want to fly through one subject while needing to walk more slowly through another. It can be dry and boring. I think highly sensitive people crave and need more depth and beauty than the average person, and it’s not often found in a workbook or textbook. There can be a lot of busy-work that can clutter up an already overstimulated mind. It can get expensive, particularly programs that require enrollment and provide teacher help. I have heard (but do not have direct experience) that working with your state’s cyber school can be particularly frustrating in the amount of work, busywork, and inflexibility. Over the past 11 or so years of homeschooling, we have dabbled in this style more than once. Honestly, though, my more highly sensitive children do not do as well with this style, but that could be due to other personality factors. The emphasis on correct answers, test scores, more “dry” information in textbooks, and fitting in to a proposed schedule do not bring out their best qualities. As their teacher and possibly the most highly sensitive of the bunch, I like some things about this style but dislike others. It was a good fit for times I needed someone else to be responsible for “something” because I was full up. Ultimately, I was still responsible, but it was a healthy way to get the basics done without feeling like the whole world was on my shoulders. At the same time, I have difficulty with the pressure of getting things done at a certain time during those years that we had enrolled. Not like I want to be all loosey-goosey all the time, but just *knowing* there was a deadline and I had to meet it put pressure on me that I didn’t need, especially when I knew it didn’t have to be that way. I could see the green grass over the homeschooling fence and missed it! I felt guilty crossing large portions off a pre-written schedule, or “wasting” half of workbooks that we paid good money for, when a child quickly grasped a concept or a book had too much review. On the flip side, I felt pressure when a child was “behind” and tended to at least subconsciously put that pressure onto the child. I enjoyed the quiet that one child provided me (the one that liked to get up early and get it done all by herself), but I needed to poke and prod several other children all day every day, and that is not one of my strong suits. Nor do I want our life together to be like that all the time. I think that was my greatest gripe with the “school at home” style. I don’t want our life together to be like that all the time. Elaine Aron, who coined the term “Highly Sensitive Person,” calls us the “royal or priestly advisors.” We tend to want to think more deeply, desire a rich personal experience of life, and want to impart our wisdom to our children of the true, the good, and the beautiful of existence. This doesn’t mix as well with the scripted and drier “school at home” style. What are your experiences with the traditional or school at home style? Does it mesh well with your particular personality and family? I’d love to hear about it in the comments. Interesting! I look forward to reading this series.